One of the neatest gadgets I've ever seen and that I'm using is the SideClick remote. It solves a problem many people have, does it well, and does it very inexpensively. If you are a cord cutter, and your main source of TV entertainment comes from your Amazon Fire TV, or Apple TV, or Nexus Player, or Roku then the Sideclick remote may improve and simplify your life for under $30. I get all my television entertainment from my old Roku box. Using this inexpensive box, I can access Amazon Video, Hulu Plus, Netflix, as well as lots of PBS, local, national and international news, and about 3,000 channels offering 300,000 movies and TV episodes. It is just a little more comprehensive than either Apple TV or Amazon's Fire TV which are the other two major streaming devices. To actually run my roku however, I had to use a TV remote, a Soundbar Remote and also my Roku remote. So I needed 3 remotes just to use one service! Now, it's all in one. 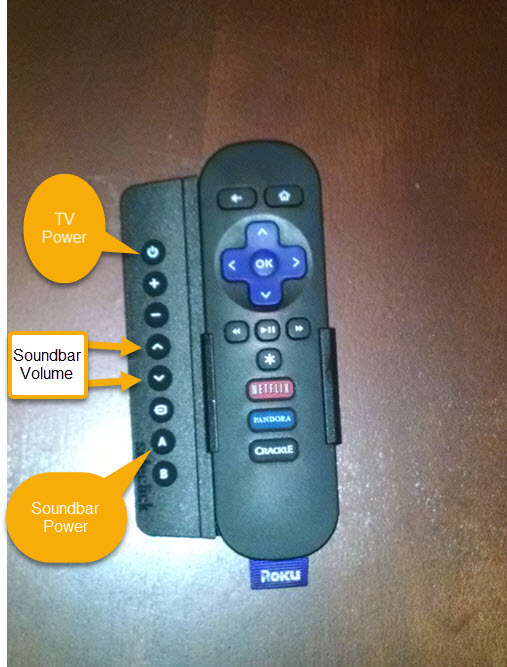 The Sideclick remote clips securely onto the roku remote (or Fire or Apple TV remote) and gives you 8 programmable buttons. I used the power button for my TV power, the A button for my soundbar power, and the up and down arrows for volume on the soundbar. I can't think of anything else to do with the other 4 buttons, but they could be used for the TV input, TV mute button, video mode or an xbox if I had one. So, how long did it take to program this remote to work with both my TV and my soundbar? About 30 seconds. That's 4 buttons controlling 2 different devices taking less than 10 seconds per button. Why? Here's a reason this is so cool. Assuming an Infrared remote (Sideclick won't work with bluetooth or RF), you put the current remote facing and about an inch from the sideclick and just push the top and bottom buttons to tell the Sideclick you are going to program it. Then press the key are are going to program and press the corresponding key on the old remote. The old remote sends its signal, and sideclick captures it. That sideclick button is now paired with that signal. Then repeat for each key you want to program on whatever remote you want to use. When you are done, press the two keys again to end the programming session. Now, each of the Sideclick buttons will send the IR signal it was paired with. The Sideclick sells for $29.95 and for both the Roku and Amazon Fire TV they are currently exclusively at Bestbuy. I ordered mine online and picked it up at the nearest store three days later. The one for the Apple TV is more widely available.